As predicted in Hell and High Water (page 190), NOLA Media Group today announced that The Times-Picayune will abandon its longtime Howard Avenue headquarters – including the iconic clock tower, a photo of which is featured on the dust jacket of the book – and begin printing the newspaper at the Mobile, Alabama, operations of its sister newspaper 145 miles away. The last of the employees who create the print edition of The Times-Picayune will move from 3800 Howard Ave., the newspaper’s home for 44 years, in late 2015 or early 2016. The move, expected in late 2015 or early 2016, will lead to the elimination of another 100 employees, NOLA.com reported. 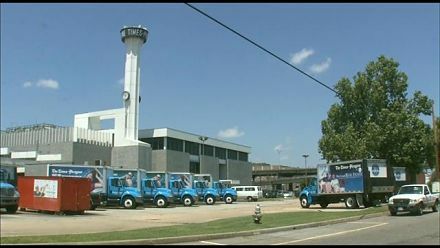 The paper will be printed at the facility that now prints sister newspaper The Press-Register, which, like The Times-Picayune, became a three-day-a-week newspaper in October 2012, and shed hundreds of jobs. It will be the latest newspaper owned by Advance Publications, which began rolling out its “digital first” strategy at its smaller Michigan newspapers in 2009, to jettison its legacy, company-owned headquarters in favor of newer, glitzier leased office space, as noted in sister blog dashTHIRTYdash.org in January 2013. The company will consider donating the facility to a non-profit, according to the NOLA.com report. Layoffs associated with the move will be the largest since the newspaper’s massive reduction in 2012, Louisiana competitor The Advocate reported, with job terminations primarily affecting those who print, assemble and package the print newspaper. The roughly 30 employees who have continued to work at 3800 Howard Ave. copy-editing and laying out the paper will move to The Times-Picayune’s former office in Metairie, which was essentially shuttered after the company shifted to “digital first” in the fall of 2012. The Times-Picayune and its sister publication, The States-Item, moved from downtown New Orleans to Howard Avenue in 1968, six years after the company’s 1962 acquisition by Advance Publications, the New York- based company owned by the billionaire Newhouse family. The building housed the the main newsroom, printing presses, packaging facilities and business offices for 44 years, until 2012, when “digital first” led to the termination of more than 200 employees, including almost half of the newsroom. Most of the remaining employees subsequently moved to the top two floors of One Canal Place, a downtown skyscraper, where they continue to work. The Advocate reported that leaving Howard Avenue also likely has a significant psychological goal for NMG and Advance, according to Loyola University instructor Michael Giusti. “They wanted a ‘burn the boats’ strategy, where you come to the new world and you don’t want to have the temptation to sail back,” he told The Advocate.